George grew up in a Christian home in Southern California. He has been a member of Heritage for five years and, along with his wife Birgit, lead a Home Community Group. Prior to that he and his wife were members of Vineyard, Newport Beach where George served on the Board of Directors for eight years. George attended USC where he received a Bachelor and Master’s Degree in Business and Real Estate Development. He also has a Master’s Degree in Cross Cultural Studies from Fuller Seminary. He is the Managing Partner of Downey Management Group, a real estate investment and management company. Birgit has a degree in Teaching and Occupational Therapy from Vienna University. 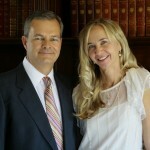 George and Birgit have been married for twenty one years and have four children: David, Hannah, Jonathan and Stephen. They have a heart for the German speaking world and have done ministry trips to Germany and Austria. Together, they love serving the Lord and serving others. They live in Laguna Niguel.